Conservative Strength and Stability Simulator. Stop Candy folk from fleeing their country by removing their disguises as they pass through airport security! Another lifeguard saving little Jimmy? Not on your watch. They can't kill you, but where they're pushing you will. Watch a raccoon eternally fall in hilarious fashion. itch.io Community » Game Development » Devlogs · Posted in SHUMP - A Platformer blended with a Shoot 'em Up. COMING TO iOS OCTOBER 25th! Hey Folks! An update on this! SHUMP is going to be released on the 25th of October and is currently available for pre-order on iOS! itch.io Community » Game Development » Devlogs · Created a new topic SHUMP - A Platformer blended with a Shoot 'em Up. COMING TO iOS OCTOBER 25th! What inspired you to make SHUMP? The reason for developing the game has come from a lack of satisfaction with vertical platformers (upwards movement I should note, Downwell is superb). They often feel clumsy and falling down and losing progress rarely feels good. Shooting platformers in particular handle poorly, where juggling not falling off and killing enemies tend to clash (Particularly on mobile where axis shooting isn't often an option). My solution for worrying about shooting was to make firing a default, adopting the schmup function of constantly firing. This on mobile allowed me to focus on player movement and save 1/4 screen space for required buttons. This combined with my messing around with a minimalist bullet hell at the time made it clear that a bullet hell platformer was the way forward for the project! What platforms do you plan to release this on? As with my previous projects, I'll be primarily be launching on iOS, but will be looking at doing a browser version of the game. On top of this, me and Katy will be designing an arcade coin-op cabinet for the game that we'll be placing in local pubs/venues. As with the rest of my projects, I'll be considering android but until Google Play improves it's curation systems for indies, there's not enough incentive to release there. Other platforms would be dependant on how this goes and possibly would involve rebuilding the game in Gamemaker. It has been 6 months since I released Corporate Salmon, so there is a matter of urgency to get this project done as fast as possible. I'm currently working to get the majority of the work done by August, with the intention of submitting it to Apple early to early-September (Release October). Apple has introduced a pre-order system which I may investigate adding it to there to create a tangible deadline to finish the project by. I post a lot of content on my Twitter before putting it on here, so if you're interested in the scoop, go there! Here's some GIFs of Corporate Salmon showing 2 levels of gameplay! 4. Rival fish jump power put also frequency of jump increased, meaning they can keep up with the accelerating escalator. 1. The play button is still not clear enough for first time players (Admittedly I need a tutorial reset function as many people played the App without the tutorial that removes other icons from the screen). 2. The green/red jump lines were mistaken several times for just markers/signs rather than something that could be interacted with, so I need to create some kind of visual indicator that you should jump on them, whether that's a little tutorial pop up or text above the objects for the first couple of rounds they are in the game. May also require more revising of the design - If any of you have any thoughts for an alternative or examples of jump bars done right, let me know. 3. Spamming - Currently some people who played the game just repeatedly pushed jump to launch the fish up the screen. To counter this, I'll be adding in some variables that will make the level harder if spamming occurs. Examples of this might be increasing the frequency of red lines on the screen (You don't want to jump on those), possibly look at a subtle additional increase of escalator speed or volume of fish launched at player. I was thinking about having a stamina function, but I'm wanting to keep clutter on the screen as minimal as possible and don't want to create scenarios that can't be beaten or escaped from. 4. One other thing I'll be looking into to control spamming is collision detection. For example, should a salmon be able to jump on the side of a step to climb it or just the flat top of the step? I'll be experimenting with that now. I've also got another feedback session in 2 hours, so I'll gather some more feedback there. 3. Tinker with the collision detection for the escalator steps. That's all for now, stay tuned for more soon! I'll likely be putting up a longer playthrough in the next couple of days, as most have just been quick excerpts. Thanks for all your comments by the way, always helps! Hey! You get over the word IT to trigger the game starting, as this is how you kill enemies/reload! Hope you have fun. 2. Enemy pathfinding - Obviously a tough nut to crack, but having the enemies actively swarm entrances with no blockades would be nice. Music was catchy as heck, btw. Genuinely one of the most novel puzzle designs I've played in a long time. Had good pacing, let you make mistakes without crucifying you for it and really enjoyed how you adapted the mechanic to different puzzle structures. Game also has a lot of potential in that you have an infinite number of colours but also a huge number of arrangements of blocks. Brilliant work, hope you'll consider expanding this concept further. Novel mechanic which is unfortunately hampered by a steep difficulty curve, although I can appreciate you've achieved all of this in a weekend! Would've suggested having a couple of levels with literally no hazards just getting used to moving around, then start slowly adding them in. If you were planning to build this for mobile platforms (Which I definitely would, this has a bunch of potential), split the screen down the middle (One control for either side). With that, you could then tap on a side if you want to switch to it, then if currently on a side when tapped make the player jump (e.g. You're on the left side, you tap the right side of the screen and move over there, then tap the right side again and jump over a spike/ravine). Hope that makes sense and look forward to seeing where development goes on this. P.s. One way that I'd be interested to see this game go instead of level based (Which once again, I can understand why not achievable in a weekend) would be to have just one level which has plants grow back and sprout into other things if untrimmed for too long. Pacing is really nice for the project, you've got the level design flow down to a tee. Only thing I would say that was misleading was the objective - Since you have a fuel gauge at one side of the screen, I assumed I had a limited resource that only refilled when the pickup was collected (Rather than it being the resource to unlock the ship). Making it something different like a piece of the ship, an artefact, coordinates would've reduced early confusion in game. Great work. These devlogs are quite useful for keeping track of lists, so going to try and keep this on track till the intended launch date, around the end of July. 1. Rather than having the escalator restricted to the screen space, I've made amendments so that you can actually climb the escalator (Rather than just getting pushed back down). This was a big undertaking (And basically required gutting a lot of functions), but has definitely been worth it. Gameplay has a better flow now and a tangible end to the game rather than just a slow point grind. 2. Colour revamp: Whilst I am able to draw stuff, I am utterly incompetent with colour grading and theory. If you've seen some cohesive themes in my games, I do enjoy pink and green as a palette, but in the case of Corporate Salmon, there was a lot of colours that clashed in awful ways. So, I enlisted the help of the NES palette to remaster the game visuals with. Just having a palette to work with that just compliments across the board is super fun. 3. UI revamp: Like with Narcissus previously, one of the elements of my games that gets the most attention during development has to be the user interface. After 4 revamps, I decided to hack out all of the original gimmicks such as the line graph, profit/loss chart in the corner of the gameplay screen and in turn simplified the progress meter and final score listings. The setup is a lot cleaner now which I'm just about happy with (May still make some amendments yet!). As for the main menu, I replaced the text in there previously with the 3 main buttons of the restart screen. 5. Staggering the gameplay: Upon loading up the game for the first time, all UI elements are cut except what you need to progress to gameplay (The play button), then slowly gameplay elements are introduced with each death. It's a much smoother transition into what's happening, particularly after watching a lot of people scratching their heads intitially to even start the game or even know what was happening. 6. Boss level at the end of the game with a floppy ragdoll bear. Was a stupid amount of fun to work on, still a lot of amendments to sort out. 7. A LOT of tiny refinements and fixes. What are the major things that I'm needing to tackle from this point? A. Finish the end of game scene: Since updating the camera movement for the rest of the game (Allowing the player to advance at their own speed), I need to do the same for the Boss. I also want to do one final layer of polish and refinement on the level itself and finish the ending. B. Shop Refinement: Whilst the majority of the functionality is there, I need to create at least 25 different suits of varying prices for the final game. I also have an itch to update the visuals of the store, as there's something still off in my eyes. C. Font design: I've struggled up to this point to pin down the fonts I want for the game, and as I've updated the UI for the game I've changed the font to various designs. I need to pin down the specific sets for example the monitor screens versus the general gameplay UI, then update the rest of the game UI to match. D. Refinements to currencies and scores in game: Whilst the coins in game are a good currency, the profit and loss function is consistently lost on people. I'm going to be figuring out whether cutting it back to purely coins works or whether I can save the multiplier function somehow. E. Profit/Loss line positioning: One of the big complaints I've had so far is people being unable to jump past the loss lines when they're in a certain position. For this, I'll be experimenting with what collecting them means, whether there's a better way to do it and trying to make their positioning more uniform. F. Streamlining the gameplay loop: Currently the player must wait for their coins to be counted before restarting the level. I recently played an App that forced you to watch these figures rise without offering the option to skip the "OOOH look how many points you scored" section. It kills the pacing and I'd like to be able to left people watch that if they want, but be able to skip it and still have their currency counted. G. App functionality: Adding in stuff like the AD functionality, iAP to disable Ads, leaderboards, reward ads (And getting coins to buy suits). I. Produce App Store materials (Trailer, logo, banner). J. Look into the possibility of localising the game. I think as well on top of all this, I'll be looking at putting out a flash build in a couple of weeks to test the functionality and gauge interest. Keep an eye out for that! Thanks for your patience, I'll be aiming to update this on a semi-daily basis; I'll be taking the game to an event this weekend so I'll hopefully get some more feedback from there! 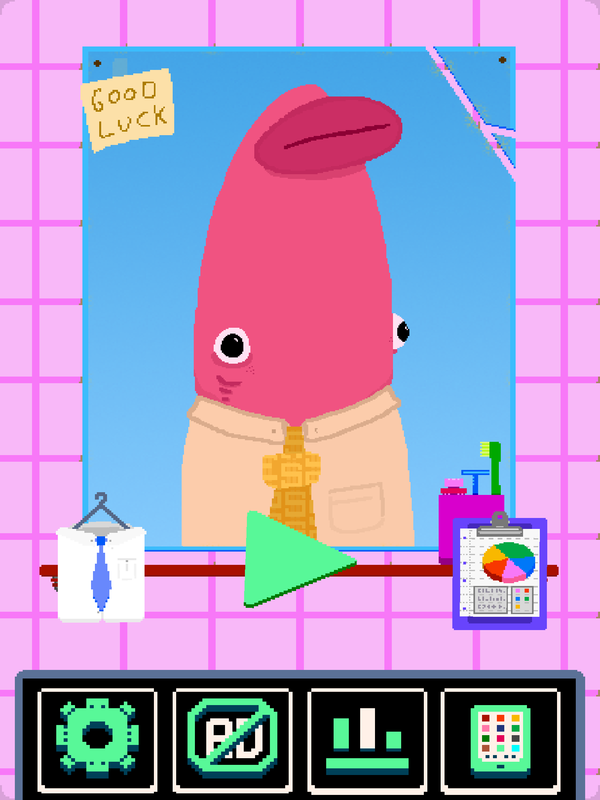 Don your best suit and flop to the top of a fishy financial escalator in Corporate Salmon. Buy suits to feel better. I've been working on the project for 3-4 months (As well as flitting between other projects), I expect this one will be in development for another month or so. If you hadn't guessed from the format of the game (And my previous projects) this is a game for mobile, I'll be making it free with ads (With the option to pay to remove them). I'll probably also chuck up a version of the project on a flash portal as well! Any thoughts on what you see so far would be greatly appreciated, as well as any questions you have. There should be more info coming soon in the next few weeks! I will try and keep this page nice and up to date with what I'm up to, I find posting fixes/updates helps me keep track of where I'm at, particularly in the later stages of development where progress isn't measured in huge leaps and bounds. Twitter is my usual stomping grounds, for super up to date stuff check out what I'm posting on there. I really like the concept, although I do feel that the game would be more fun with each player having a balloon and their own target to aim for on the screen (Or the player having 4 or 5 balloons to try and stop). I do like how accessible this is as a controller mind you, so great work on that! Thanks for your feedback so far folks! Regarding the physics of the horse, the animations of the character are calculated using physics rather than a set speed (To avoid the animations snapping as the x/y speed changes, providing instead a gradual change between them). I'll likely tone down the speed at the very least of the horse since it really does go like a bullet! When playing I've gotten used to tapping the keys to trot at a speed the cows can keep up with! One of the things that doesn't help the sliding effect is the fact none of the actors have walking animations (Once again, made in like 20 hours!) Pretty busy today but will definitely get around to checking out all of your projects and giving you some useful feedback! Trasevol_Dog Thanks! I was pretty short on time (Started with 20 hours to go and was only able to use about half of that with it being me and my partner's 2nd anniversary) so had to keep the scope super small. Glad you liked it anyway! - Make sure you haven't set the physics to "Cannot be pushed" - If you have an object that cannot move and an object that cannot be pushed collide with one another, it causes one to pass through the other. - Make sure the collision is not set to a sensor when it's meant to be a solid collider! Hope you've managed to get to the bottom of it and glad these tutorials are seeing some use! This is truly an outstanding game. Have sunk about 2 hours into it and finally beat hard mode. Great job. MORSE community · Created a new topic Feedback on Morse - Let me know what you think of the game! I hope you enjoyed playing Morse! If you could, I'd greatly appreciate your feedback on the project. Here's some basic questions I'd be super happy to have some answers for! 1. Was it clear who's team you were fighting for? 2. What was the first letter you managed to learn to a competent level and what ones do you still remember? 3. How quickly did you grasp the controls/How to output Morse? 4. Does what to do require greater explanation? 5. Did you manage to reach a game win/lose state? 7. Does the tutorial need to be in greater depth and do you have any suggestions? 8. Was the difficulty curve too steep and was there a point where things smoothened out? 9. Were there any game breaking bugs/issues that came up? 10. Was moving between the different battlefields an easy process? Any other comments and thoughts would be super awesome. Thanks for giving this a look and I eagerly await your feedback! MORSE community · Created a new topic Bug Reports - Help me fix any bugs in the project! Hey Folks, use this spot to drop me any bugs or problems you find with the project. Try to be as precise as possible and include screen grabs. Thanks!